I decided to make this topic since I noticed that it was absent in this forum. I have both a testimonial and a question. I used the powder today, and wow, I noticed that people were definitely eyeing me big time. Interesting observation - I received attention from both men and women (I'm a male) . So, does this mean Look Me Over has a multiple uses for both sexes? I'm assuming it does based off of my experience. Congratulations on all the attention! Yes, Look Me Over can have mutiple uses, just as you experienced. Pray your petition when you apply it and ask it to work towards your specific goal, and hopefully you will see that take shape. I gotta say I LOVE LOVE LOVE Look Me Over powder. 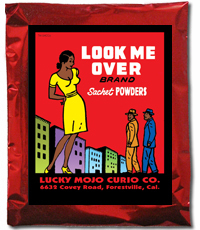 I made my body powder combining Look Me Over powder, Bewitching & Queen Elizabeth root powders (plus glitter) and I love the attention I get Thank you Lucky Mojo!